Saturday was girls night out, and we got crafty! My coworkers and I met up for dinner, and pottery painting at Color Me Mine! Such a fun evening, it was great to get out with friends and do something a bit out of the ordinary! Each Saturday is PJ night at Color Me Mine, Pjs and painting great combination. I got a few strange looks at dinner, but you know what I made a fashion statement and was comfortable! I was shocked when we walked in and saw that Color Me Mine allowed you to bring in drinks such as wine and beer (who knew?). Would be a fun date night if you ask me (maybe Mark and I will go when he is here)! I had the hardest time trying to figure out what piece of pottery I wanted to paint (I would have painted one of everything if I could have). 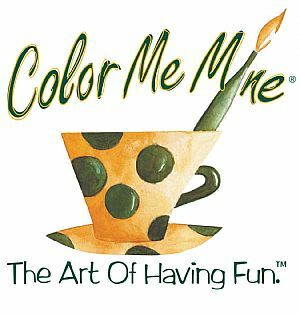 Color Me Mine had tons of cute dishes/serving items, would be a perfect personal touch to any ones home! I finally decided on a large dinner plate. Which I plan on using as a sort of catch all tray in my bedroom! 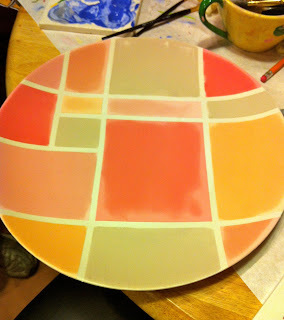 I picked 5 different colors and did and created a mosaic pattern! I figured I couldn't go wrong with big geometric shapes, it was just like a coloring book (I just had to stay in the lines)! I cannot wait to get it back this week! Whats a fun girls night out that you have had? Ooo love the dish! So cute! how cute! My in-laws take a pottery class and it looks so fun! Ithink I would like the painting more myself! Yea I am not sure I would bee good at making my own pottery! But painting is fun! Hope your having a wonderful day! how fun! and your plate is so cute! i would love to do something like this. Thank you! You should def look up and see if there is a place like this in your home town! You and the hubs could make it a date night! what a fun night out! I love the way you designed yours Hilliary! Thank you! It was fun to tape out the design, I think I changed it about 3 times! Hope your having a fabulous day! I love the plate it came out fabulous. I am actually doing a Color ME Mind Event next week, and I am so excited!! Thank you, and Have so much fun! I love what you painted! So pretty I'm a perfectionist & not super artsy so I always find it hard to pick a piece and paint it without causing myself anxiety! ah! I actually messed up and painted the wrong color on top of a different color. I freaked out (huge perfectionist)! But I figured its on the bottom no one will know! How fun! Love your dish! my friends have tried the wine + canvas painting place here and loved it! fun night! I have always wanted to do the wine and canvas painting, Indianapolis used to have a deal for it on living social all the time! It sounds like so much fun! we used to have a similar place to this where i lived, but i think you even made the piece of pottery first. Plate looks great! Thank you! Making your own pottery would be so neat, but I am not sure I would be any good at it! Sounds like some great girls nights! You should def look into it, we had a blast! Next time I am bringing wine! So fun. You did a great job! So pretty! I am doing a similar thing with girlfriends next week. Its an art class and they serve you wine, so fun! Sounds like so much fun! I can't wait to hear how it was! Hope your having a wonderful day! That looks like so much fun!! I have always wanted to do one of those. Your geometric plate looks great! OOO your plate turned out really well! Love that you picked a serving piece. Thank you! There were so many great pieces it was hard to decide, I am def going back again! That looks great..I love painting pottery and pajama night sounds super fun! I so need a girl's night out...mine's 3/2. Seems so far away. And a craft night would be so up my alley! This definitely is something different to do, and such a great idea! Your plate design is awesome, i'd love to have something like that on my coffee table.